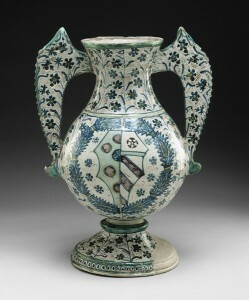 Marriage, crucial both to the continuation of a family’s lineage and to maintaining its wealth and prestige, provided a major occasion for commissioning objects to decorate the home. Objects were designed to celebrate the alliances of important families as well as the economic and social advantages that accompanied these alliances. 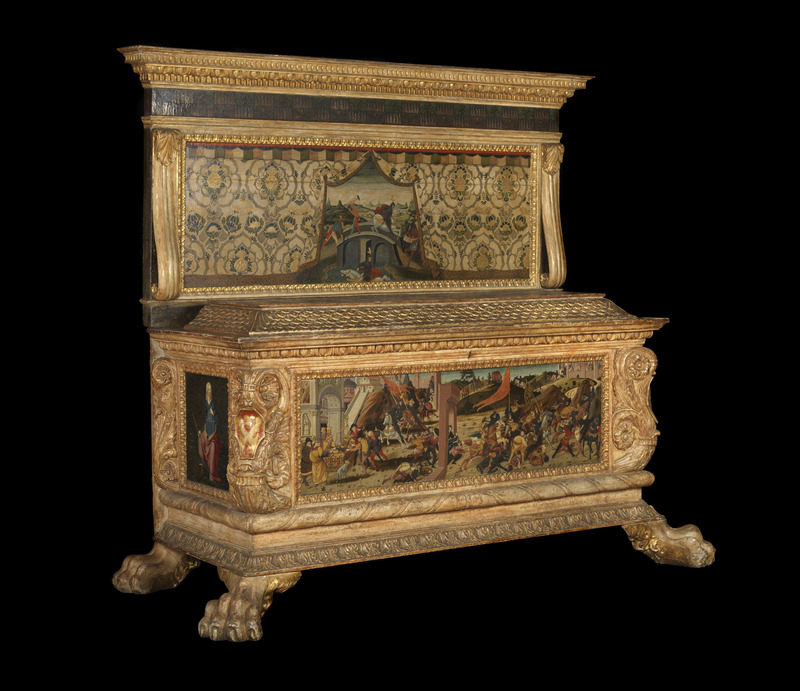 An indispensable item for marriage celebration was the cassone, a large chest often filled with clothes and linens and usually part of the bride’s dowry. Finely decorated chests of this type, featuring a prolific application of gold, spoke of the bride’s status as a member of a wealthy family. A good example is a now dismantled cassone—only the front panel of the chest has come down to us—that takes up as an appropriate marriage theme the biblical story of the Jewish heroine Esther and her marriage to King Ahasuerus. The name “ESTER” is inscribed in the center scene on the right, beneath the heroine. With its lavish use of gold for the depiction of hanging curtains, gowns, and horse trappings, the Esther cassone testifies to the wealth of the bride and almost certainly would have been part of her dowry. The main scene at the right shows the sumptuous wedding feast of the bridal couple Esther and Ahasuerus, taking place in an open-air portico known as a loggia that was used in the Renaissance for celebratory events. At the left, a showy procession of guests arrives for the banquet. The scene summons up the type of wedding celebration that would take place among well-to-do families of Renaissance Florence, a resemblance emphasized by a setting that includes architectural features of early fifteenth-century Florence. The church in the middle of the panel displays many of the features of Florence’s cathedral, S. Maria del Fiore, and the architecture of palace and loggia echoes details of fifteenth-century Florentine domestic architecture. Cassoni became a prime vehicle for introducing secular narratives into the repertoire of Renaissance art and popularized the use of subjects drawn from classical history, ancient poetry, and mythology. The virtues of the owners of these cassoni came to be associated with the virtues of the ancients. An exceptionally well-preserved and well-documented wedding chest was prepared in 1472 in connection with a marriage that joined two Florentine families, the Morelli and the Nerli. A team of artisans was employed to prepare this extraordinary object. It was carved, gilded, and painted, drawing on the talents of the wood-carver Zenobi di Domenico and the painters Jacopo del Sellaio and Biagio d’Antonio. In this instance, the groom, Lorenzo Morelli, paid for the chest as part of the furnishings for the chamber outfitted at the time of his marriage to Vaggia di Tanai Nerli. The paintings recount the virtuous and wise leadership of the Roman leader Marcus Furius Camillus, as related by the ancient Roman writer Livy. After a failed attempt at the settlement of a siege by the ransom of gold vessels, shown at left, the enemy is conquered by the Romans, at right, under the direction of Camillus, who is singled out by his forcefully raised sword. Full of action and vivid color, and including the abundant use of gold, the scenes focus on detail rather than on a linear narrative (see Time and Narrative) and were meant above all to be pleasing to the eye. Prestigious marriage alliances could be heralded even on more humble household objects. A double-handled vase presents the joined coats of arms of the Medici family, at left, and the Orsini family, at right, placed together on a single shield that is surrounded by a wreath. The vase celebrates an alliance between the powerful Medici of Florence and the influential and wealthy Orsini of Rome; it was most likely prepared for the marriage of Lorenzo de’ Medici and Clarice Orsini in 1469. On display in the home, it would have served to keep the memory of this illustrious alliance alive in the minds of family and friends.